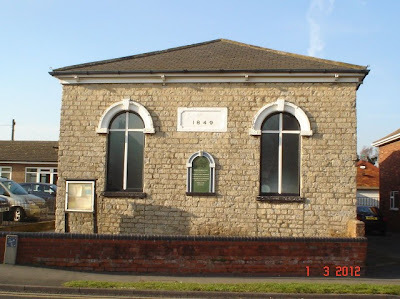 This chapel was built in 1849, although there was another chapel in Broughton, down Chapel Lane. The chapel has been extended to include a large chapel hall, which is used for a variety of events such as coffee mornings and the children’s club. 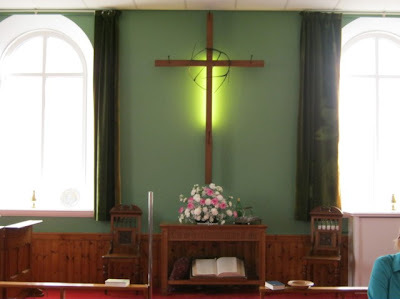 As soon as you walk in the chapel, your eyes are drawn to the huge, wooden cross in the middle of the front wall. At the top of the cross there is a wire sculpture, this is to represent the crown of thorns worn by Jesus on his crucifixion. Also, there are some large nails in the cross to show where Jesus’ s hands and feet were nailed. The cross has a light behind it, so it can be illuminated during the services. Underneath the cross there is a huge old Bible. Bible comes from a Greek word meaning library, because actually it is a collection of books rather than being one book. The Christian Bible is divided into two parts. The first is called the Old Testament, containing the 39 books of Hebrew Scripture, and the second part is called the New Testament, containing a set of 27 books. The first four books of the New Testament are the gospels, which recount the life of Jesus and are central to the Christian faith. The font is positioned on a stand at the front of the chapel. 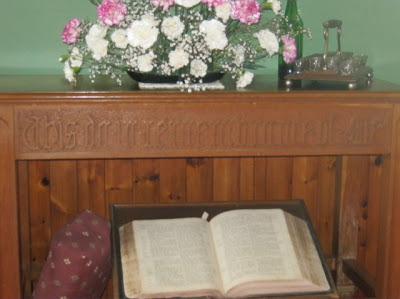 The font is used to baptise people, usually babies, into the Methodist Church. Not all chapels have a font in use any more. A baptism is performed by a Minister, they use the water from the font to baptise the child. Furthermore, the children are given a baptism certificate and they are then included onto the cradle roll. Usually once a month, there is a communion service at the chapel. This service is led by the ordained minister and the congregation share bread and wine. This special service remembers the Last Supper, when Jesus took the bread and wine and asked his disciples to take them in remembrance of him. At the chapel, the wine is given in small, individual glasses and the wine is non- alcoholic. The communion is shared towards the end of a service and the Minister may follow a set of prayers that are written in a Book of Offices. There can be different sets of prayers for special Sundays, such as Easter, Lent or Christmas. Also, at the front of the Chapel is the pulpit. This is where the preacher or Minister stands to give their sermon. During the service there are also prayers, the singing of hymns, readings from the Bible and a blessing.